James Bond has to be the world\'s greatest spy. He has all the best movies, all the maniacal madman trying to nuke the world, all the games. In fact, that is what makes this new Bond game so endearing. The game. EA Games actually went to the Die Another Day movie shoot and digitally scanned Pierce Brosnan\'s face to have an accurate looking(not accurate sounding. Brosnan didn\'t do the voice-over, but the guy who does do it does a pretty good impression) Bond that is pretty close to the movies. This is a much needed improvement over the last game\'s Bond, who looked like the designer\'s couldn\'t make up their minds between using Roger Moore, Pierce Brosnan, or Timothy Dalton for Bond\'s face, so they combined them, and then used a little hint of Sean Connery\'s voice(though not really). The truth is that this is truly the best game since Rare\'s bestselling GoldenEye, which used a pretty good N64 rendering of Brosnan\'s face, but couldn\'t use his true voice. Anyway, before I rant about games into a damp hole, let\'s move onto the review, shall we? Well, as mentioned before, the graphics are good. I found myself waiting for every cutscene just so I could see the story and goggle slack-jawed at the TV screen in amazement. I rented this game at the same time as Timesplitters 2, and I have to say, I much preferred this game to that. There is no , so the game developers chose to be violent, but not in the Die Hard way. Enemy AI is smoother than Medal of Honor Frontline\'s, and so is the animation. Many times I said, what the hay, and shot a bad guy in different places to see what he\'d do. Not that I\'m trying to be gross or anything, but that is exactly what it\'s like-- the enemy wouldn\'t just stand there. He\'d yelp in pain, and then go on firing at you. However good the animation and environments look, the real place this game shines is in the car chase scenes, which were developed using the Need for Speed engine. Needless to say, these parts were fast, especially when on ice, and slick (no pun intended), with some of the most Hollywood-like explosions imaginable. Much better than Agent Under Fire\'s driving sequences. Time and care has been spent with the environments, too, with one level ranging from a Japanese villa to a garden, to a major office building. Overall, the environments show realistic damage to walls, the particle effects are really cool (though nothing close to Metroid Prime\'s), and the weapons take a page from Perfect Dark, and show realistic reflection, something that Medal of Honor Frontline lacked. Gameplay was really good. I mean, I kept on coming back for the story, the action, and that dang level that requires stealth. The driving sequences were replayable, and the designers introduced several new things. First off, and perhaps the most important to replayability, was the idea of medals. These unlocked certain modes, certain extras, and had collectable cards with the Bronze medals. The driving sequences are few and far between. To spice the levels up. 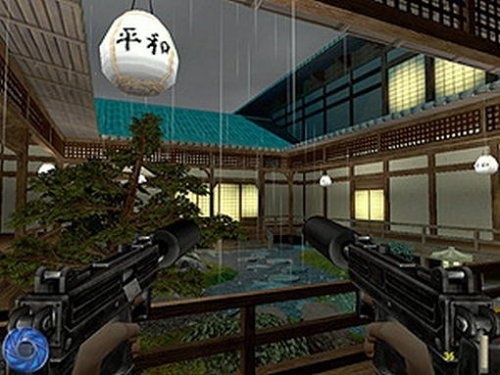 Eurocom added progressively harder enemies, mostly with really powerful guns, along with a first for the FPS-genre, the third person viewpoint. This basically means that in special sequences, such as shimmying across a wire to cross a large gap between building that cannot be crossed otherwise. Some of these special sequences add to your overall score and your Bond Move tally (Bond Moves are special tricks that only Bond would think of). Honestly, I cannot think of another game, besides Metroid Prime, that I have had this much fun with. It is exciting and action packed. If you go for action/shooter games, then get this one real soon. The default mode for control is that of Medal of Honor Frontline\'s, which is described in that review. To see that review, click here. Basically, the control scheme boils down to the scheme of Agent Under Fire, which I did not cover in the very brief review. The C-Stick strafes, and looks up and down, while the A button opens doors and the R button shoots. The D-pad changes weapons and gadgets. Easy, simple, and intuitive. Unfortunately, the console style of control, while being very tight, and most often preferred over the more PC-style of controls, is slowly being pushed out by the developer preferred PC and PS2 control scheme, which was designed for the Dual Shock Controller. Majority Rules. The only place the controls really do falter is the driving levels. If the driving was more intuitive, then maybe it would be easier, but the Control Stick is oversensitive in the driving levels, and the controls are less than intuitive. The only downfall in an otherwise very tight shooter. As stated before, current Bond Brosnan\'s voice was not used in this game. Instead, the developers made a pretty good decision in the Brosnan-stand in\'s voice acting-- except he kinda sounds too? American. The other voice actors, including John Cleese for the voice of R, Q\'s replacement, do an admirable job, and every word and syllable is accurately and expertly pronounced, like they are old pros of the game. The ambient noises sound real enough, but that is not what really stands out in the sound department. What really does is the noises that are sort of sub audible, meaning that they just kind of fade when you know what they are. These sounds do not get appreciated. The Aston Martin V12 Vanquish\'s engine purring, the screeching of tires, the sounds of gunshots, of explosions, the subtle thump-thump of a helicopter\'s blades-- these all fade into the background as a sort of accepted part of the game, when they are the real sound stars. From a Christian perspective, this game has its downfalls. The sheer fact that it is a shooter, for instance, or that it has ual innuendo, which is, really, a part of the James Bond genre. There is one saving point, though. You are trying to save the world from another evil madman. And that makes it worth all the trouble?all the trouble?